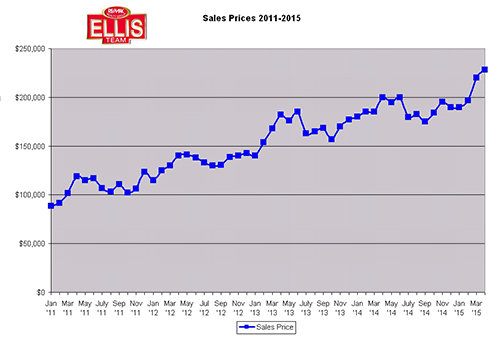 Official numbers for April were just released and median sales prices were up 14% over 2014 numbers. As you can see from the sales prices graph, median home prices have more than doubled since 2011. In fact, they’ve gone up 157.63% since January of 2011 which is a nice gain by any standards. People often call our office asking for homes they can flip. They are surprised to learn how low inventory is right now. They immediately ask about short sales and foreclosures and we tell them there aren’t many anymore. The economy has improved and so has people’s job outlook. Secondly, home prices have improved such that if they were underwater before, they may be able to sell now without being a short sale. Most of the people who were in trouble have sold via short sale or lost their homes via foreclosure awhile back. The public simply needs to know that SW Florida has recovered and it isn’t that kind of market anymore. Most locals know that but visitors who aren’t familiar with our daily headlines are not. Sometimes they read old stories on the Internet or watch old videos on YouTube. Here is a graph that shows perfectly traditional sales versus short sales versus foreclosures in Lee County Florida. Back in January of 2011 normal sales were only about 35% of all sales. Short sales were actually more than traditional sales and foreclosures were about 20%. Fast forward in time and you can see the trend. Normal sales started picking up steam in November of 2011. Speaking of old stories and old videos, we have them up on our website. Simply go to our Lee County Florida real estate website and click on the video tab or our video playlist on the right side of the screen. It’s fun to go back in time and see what we were talking about years ago and how far this market has come. Real estate is all about education. The market is rarely static and is always changing. The listings change daily and market trends develop over time. The public has a keen interest in their property value if they are an owner and where values are headed if they’re considering buying. Just like the stock market, most people don’t have time to study each property or each stock, so they rely on headlines and news articles for general information until it’s time to get serious. Our website has a tool to find out what your home is worth online. Owners really love this free tool because it gives you a value today and updates you each month as the market changes. Buyers love the website because they can search for homes and condos online without a bunch of agents calling them like on the national websites. Sellers can also search for homes as they may want to see what’s available before they decide to sell. 2 weeks ago we told you about our Buyer Advantage Program. We informed buyers of listings we were working on as listings go fast in today’s market. We listed one of the properties and it sold in 1 day on the market. We have more coming to market in the next few weeks. If you’d like to get advanced notice, be sure to signup at Topagent.com in the Buying section. We’re looking forward to a fabulous summer season. You can always call us at 239-489-4042 if you’d like to speak with us. We hope you enjoy the Free online tools we provide but remember there’s no substitute to talking with an experienced Ellis Team professional. Posted in Cape Coral, Cape Coral Real Estate, Fort Myers, Fort Myers Real Estate, Southwest Florida Real Estate.Tagged Buyer Advantage Program, Find out what your home is worth online, Fort Myers real estate prices, May 2015 SW Florida Market Real Estate Update, Oasis Riverfront rental.